There is a large and rapidly growing American subculture characterized by individuals raising some of the world’s most dangerous animals as pets. Remarkably, there are more tigers privately held in the U.S. than found in the wild. These “pets”, which are typically kept in small cages in backyards, garages or basements of homes, oftentimes suffer from severe health defects due to their captivity. Captive big cats are particularly vulnerable to inhumane treatment and these magnificent creatures are caught in a cycle of misery. It begins with captive breeding by dealers, who strip the infant cubs from their mothers. The all too common scenario is that the owners discard these wildcats when they become too big, too aggressive, or too expensive to keep, or as the novelty wears-off. The cycle often ends with these once-beloved pets living in pseudo-sanctuaries, such as unaccredited traveling zoo exhibits or wildlife parks, since overburdened accredited sanctuaries (Accredited sanctuaries, such as Big Cat Rescue, are IRS tax exempt and do not permit commercial trade, propagation or direct contact between the public and the wildlife) seldom have the financial means to provide lifetime care. Others are shipped off to hunting ranches to be shot for trophies, while many are killed for their remains (primarily fur, food or traditional Asian medicine). Such is the fate of many privately owned exotic cats that in some ancient cultures were revered as though they were gods. Keeping wildcats as pets also poses a danger to people. Last year, in Zanesville, Ohio, exotic animals were released from their cages before their owner committed suicide. Fortunately, no people were killed or injured in that incident. 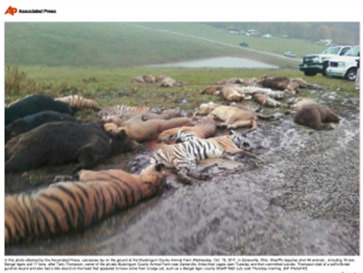 The animals were not so fortunate, as 49 lions, tigers, bears and other exotics were killed by law enforcement officials to protect public safety. Since 1990, numerous dangerous incidents involving big cats have occurred the U.S., including 21 human deaths, 246 maulings and 143 wildcat deaths. Commercial entities that keep wildcats captive also demonstrate that tragedies inevitably occur when unqualified individuals possess these animals. Recently, the Humane Society of the United States released the results of an investigation into GW Exotic Animal Park, where multiple dangerous incidents were recorded involving children and adults resulting from allowing patrons to interact with wild predators. An alarming number of tiger cub deaths at GW are also under investigation. There exists a patchwork of state laws governing the harboring of exotic animals which make it difficult to ensure public safety and the welfare of these animals. Common sense suggests that a uniform federal ban is needed to address this nationwide problem. The Big Cats and Public Safety Protection Act (H.R. 4122) would ensure that lions, tigers and other dangerous big cats do not threaten public safety or end up living in horrible conditions. As noted by the Bill’s sponsor, Representative Buck McKeon, “No matter how many times people try to do it, wildcats such as lions, tigers, panthers and cheetahs are impossible to domesticate”. The Bill would prohibit private possession of big cats except at qualified facilities like accredited zoos and wildlife sanctuaries. Repeated tragedies between humans and big cats underscore the need for passage of this legislation. The Bill would also help to ensure that exotic cats, particularly tigers, cannot filter into the illegal international trade for their parts, which fuels poaching and threatens the survival of wild populations. The Bill, if made into law, would be a win-win for both public safety and the welfare of the wildcats that are victimized by being held captive as pets or commodities. The time is long past due to protect public safety and to put an end to the suffering and abuse endured by these majestic animals and to respect their birthright to be wild and free. Ira Fischer is an attorney-at-law living in Delray Beach. He devotes his retirement to the cause of animal welfare through advocacy. The mission of the writer’s website [www.irafischer.com] is: Kindness and Compassion for Animals. 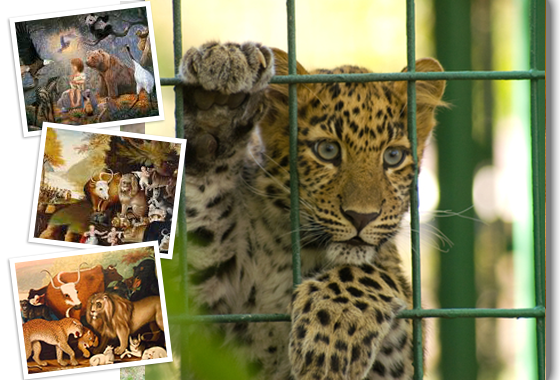 The writer is a proud supporter of Big Cat Rescue and is a member of its Legacy Society. Ira Fischer’s biography can be seen on his website. Born To Be Wild and Free by Ira Fischer can be viewed on the website of Big Cat Rescue. H.R. 1818 - Big Cat Public Safety Act was introduced into the 2017-2018 session of the House of Representatives. The bill would ban the private possession of big cats as pets. You can help to ensure that this law gets passed by contacting your members of Congress and asking them to champion the bill. Take action by visiting Big Cat Rescue and clicking the “BigCatAct.com” link. The highly acclaimed documentary The Elephant in the Living Room takes viewers on a journey inside the American subculture of raising the most dangerous animals in the world, as common household pets. The film exposes the shocking reality behind the multi-billion dollar exotic pet industry into a world rarely seen by most people. The exotic pet trade is highly adept at keeping their true identity from public visibility and it is not uncommon for breeders or dealers to masquerade as wildlife sanctuaries. The Truth About Sanctuaries discusses the difference between legitimate sanctuaries versus pseudo-sanctuaries and provides helpful insights to avoid being duped by people and entities affiliated with the exotic pet trade. Before visiting a so-called wildlife park check to see if the entity is accredited with either the Global Federation of Animal Sanctuaries or the American Sanctuary Association. For dos and don’ts of charitable giving to wildlife organizations and other animal welfare organizations, see Ira Fischer’s Guide to Charitable Giving for Animal Welfare Organizations For resources concerning the issue of captive wildlife, as well as interesting and informative books and films that journal the fascinating intelligence and incredible beauty of animals in the wild, visit Ira Fischer’s Library of Books and Films About Animals. The video, Beautiful, Wild and Free, is also the name of the song that is sung by Terez Hartmann. The video shows tigers, lions, leopards and other big cats that call Big Cat Rescue their home. Ligers, Sand Cats, Tigers, Lions, Leopards, Cougars, Lynx, Bobcats…..Big Cat Rescue’s Theme Song is Beautiful, Wild and Free. Terez Hartmann, is a seasoned entertainer, speaker, forward-thinking pioneer, entrepreneur and business professional with a background in marketing and psychology. Because she was so deeply touched by her experience with the magnificent cats of Big Cat Rescue, she chose to write a song to honor these amazing creatures AND for a limited time, offer a portion of the proceeds of this download purchase to benefit the cats!